The Taxi Rank is situated on floor -1 of the airport. The cost is between 75€ - 85€ and there may be supplements for car seats, bank holidays / Sunday/ Night service. The bus service is operated by the company Alsa and is located on floor 0. The cost is approximately 10€ per person and the journey time is about 45 minutes. There are 2 stops in Benidorm, one at the Bus Station and another on the Avenida Europa. The best option is to use a taxi from either of the bus stops to reach the Hotels, the cost is approximately 5 – 10€. Again there may be supplements. If you have reserved a private transfer with one of the shuttle companies, these are located on floor -2. Our recently redecorated, comfortable double rooms are bright and welcoming. *Our new top floor double room has a fresh modern design, fully equipped bathroom with a walk in shower, fabulous sea views but no balcony. The Junior Suites are modern and spacious and you will have a Satellite TV, Free Wifi, telephone, bathroom, fridge, coffee maker, safe deposit box, private terrace at your disposal (subject to availability). Free WIFI. Our comfortable double rooms are bright and welcoming with full bathroom, balcony, twin beds, individually controlled air conditioning, heating, satellite TV, telephone, free WIFI and optional safe, kettle. Free WIFI. Your stay includes 3 hours of free SPA circuit (subject to availability). This room includes: 3 sessions of 60 min SPA circuit (jacuzzi, sauna, Turkish bath, Finnish sauna, gym, relax room). Apartament for 2/4 people with sea view. Ideal for up to four guests, this light and airy two bedroomed apartment with partial sea views offers a spacious lounge with dining area. A weekly clean is available for 7+ nights stay which includes a towel and linen change at a cost of 50€. A refundable deposit of 100€ will be taken on check-in at the Hotel Agir. This deposit can be made by cash or credit card (refunds at the end of your stay will be made in the same way). The Hotel Agir became part of the MedPlaya chain of hotels in November 2017. It is a modern and welcoming 4 star hotel located on the Avenida Mediterraneo, just 2 minutes’ walk from the Levante Beach and close to the old town of Benidorm. The Hotel Agir offers 76 comfortable, well equipped rooms which are decorated in bright, modern colours and contemporary style. Air-conditioned Double Rooms are specially designed for couples and are fully equipped with full bathroom, Satellite TV, Free Wi-Fi. For a special treat, try our spacious Junior Suites which also include Tea and Coffee making facilities and mini fridge. Our restaurant with table service, located on the fifth floor gives our guests the opportunity to enjoy an ‘Al Fresco’ dining experience with tables on the large sunny terrace or to dine inside – it’s your choice! There’s also a bar cafeteria where you can enjoy a selection of local tapas. Chill out in our rooftop pool area, the pool is open from April to October, and in summer months enjoy cocktail as the sun sets in our cocktail bar, there’s a solarium area to relax in. We look forward to welcoming you to the MedPlaya Holtel Agir! 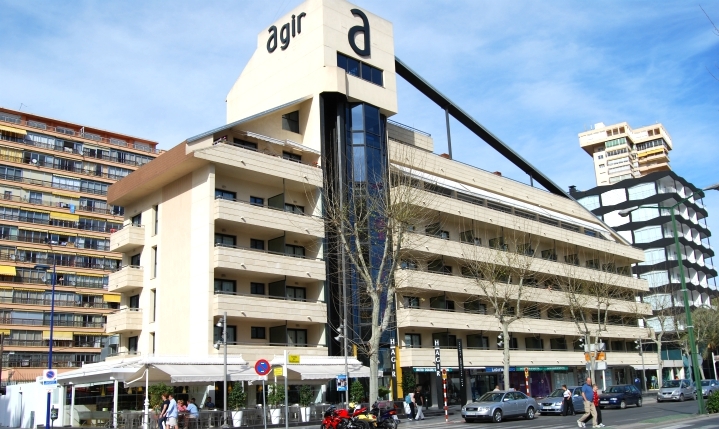 The Hotel Agir is especially recommended for adults (18 years and over). • Equipped with ramp at hotel entrance. • With the exception of guide dogs. • Currency exchange (8am to 11pm). Price = 15€ per day + 20€ refundable deposit for the card. Contact the hotel direct to make your reservation. Personal de recepción estupendo, solucionan todo satisfactoriamente para el cliente. Extraordinaria atención por parte de Tonny en recepción. Limpieza impecable y un toque especial en la habitacion por parte de Anabel. Todo el personal del restaurante muy amables y atentos in especial Jorge que hiene dom de gente. Volvemos en octubre, la reserva esta hecha. Esperamos encontrarnos con la misma gente que nos a atendido tan bien. Para nosotros es mas importante la atencion personal que el precio. Hay mucho ruido, las habitaciones parecen que son de papel se oye todo, el desayuno buffet malisimo, el colchon de muelles para ser un hotel de 4 estrellas, en fin no volveremos alli mas seguro.